Let he who is without useless bits of head frippery cast the first bad costuming stones. Or something. Black Canary is exactly right, as potentially off-putting as high heels are for a super-powered get-up, silly dangly bits coming off your head are even worse. 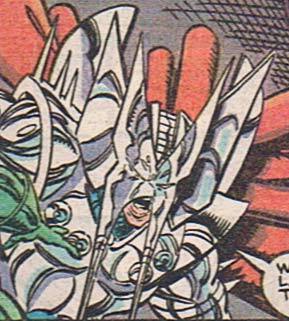 With that in mind, let us take a brief tour of bad headgear costuming decisions throughout the comics world. 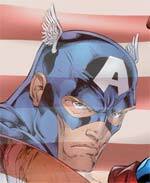 I would argue that Cap's helmet wings are the best-known and most-useless costume elements in comic book history. They serve no purpose at all and frankly, they look silly. No animal in the real world has wings coming out of its head, so I can't imagine that this is some sort of symbolism. Perhaps they're present to flap in the wind as Cap rides his motorcycle, because the other heroes were making fun of the tassels on his handlebar handles. The next step up from the pathetically small and silly looking temple wings of Flash and Captain America is Thor's Norse helmet. The wings are still a bit strange, but at least they're made out of metal and might, say, deflect a sword-stroke or something. 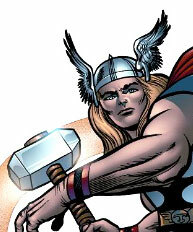 Thor just barely tiptoes over the line from bizarre to kind of cool, but mostly that's because he'll hit you with a hammer and call lightning down on your house if you make fun of him. 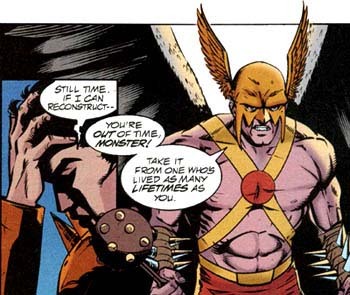 Hawkman, however, does headgear wings right. If you're going to slap disembodied animal parts onto your noggin, then they by God ought to be large and in charge. Sure, they block your peripheral vision and make it hard to go through doors, but you're armed with a mace, baby, just bash that sucker down! I think we can all agree that too much is just as bad as not enough, a claim often heard in bars at closing time but rarely so well illustrated as this. Given the potential pitfalls and well-known disasters that come from putting wings on heads, the moral of the story is clear: Wings ought to stay on the feet of ocean-dwellers where they belong. Outstanding post, Jeffrey…and oh so true.